For just €20 you have the opportunity to win a pair of tickets to one of Ireland's group matches at Euro 2012 finals in Poland. The Kilnamanagh AFC Easter draw gives you the opportunity to win two tickets to Ireland's match against Spain, Italy, or Croatia. Other prizes include an FAI Vantage Club ticket for all Ireland home matches at the Aviva Stadium for the 2012/13 season, valuable cash prizes and signed football jerseys. As the FAI only has an allocation of less than 7,000 per match, tickets for the Euro 2012 group matches will be like gold dust. This is a unique opportunity to get your hands on two tickets for one of Ireland's matches and - the draw is limited to just 400 tickets. 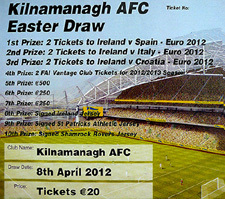 To enter the Kilnamanagh AFC Easter Draw on the 8th April 2012 please email Club Chairman John Murphy at murpjma@gmail.com. Act today as there are only 400 tickets available.